At the Maize Foundation we are constantly looking for new ways to help the community, so we wanted to give you a look into what we have been up to this past month! Some of you may not know this but in addition to running many successful businesses in real estate, finance, and marketing, our co-founder, Richard Maize also owns a successful Los Angeles food truck called Richeeze Melts™. While it was certainly a different venture for Richard he wanted to ensure that along with serving the best grilled cheese sandwiches in town, Richeeze also took on the philanthropic spirit that all of Maize’s businesses share. Most recently Rich and the Richeeze team sponsored the American Cancer Society’s Relay for Life out in Santa Clarita. 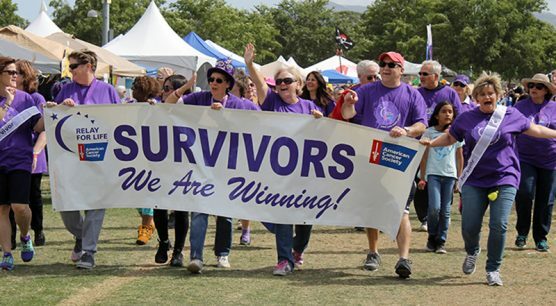 This is Southern California’s largest relay for life and together with other sponsors, vendors, and relay participants the relay raised $332,394.29! Reverend Melissa MacKinnon spoke at the opening ceremony of the 24 hour relay race and said “Many of us have been touched by cancer, many of us have had our lives changed by cancer,” she said. There are some days when you think ‘I just can’t do this.” But then, when you ask that question: ‘how do I live’…It’s the people in your life who found ways to be there. “It’s the people who…donate to Relay for Life to honor and remember our loved ones, You are those people.” It was an honor to participate in such an influential event and you can bet that Richard Maize and the Richeeze team will certainly be back next year! This month we have also continued our relationship with the creative bridge coalition which brings music education to special needs children. Next month Richard will be honored at a ceremony for the largest contributors to the coalition for his work with Lanterman High School. It is the both the coalition and Richard’s belief that music education is imperative to the growth of young minds and can truly help special needs children learn to process things such as mathematics and language in a different way. According to the coalition’s website: Scholars and researchers have studied the impact of music on education for years, and evidence shows that children benefit from it in a variety of ways such as language development, increased IQ and improved test scores, among others. And our final good news for the month of May is that our co-founder Rochelle Maize has been invited to join her husband Richard on the board of directors at Cedar Sinai! Go Rochelle! Have a charity you think you think we would like to get involved with? Contact us! We love a good opportunity to give back!